Never made it to the tee yesterday. 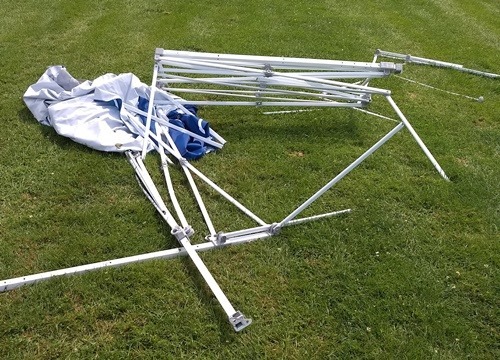 A wicked storm put an end to the day but not without significant damage. 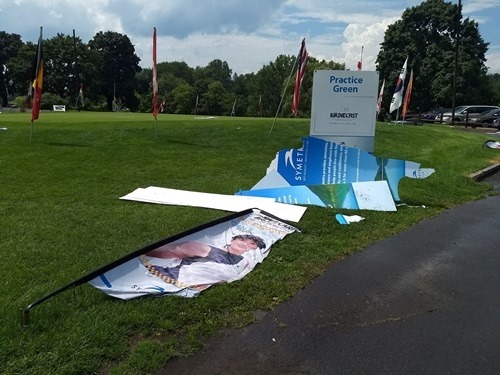 The stage that was erected for the Chase Rice concert collapsed, many tents were uprooted and signs promoting the Symetra Tour were demolished. I think we were hit with a microburst. Here’s what was remaining of caddie registration. Played the pro-am Thursday afternoon. Plenty of fun and good tippage. They only made it around nines holes the day before then the skies opened up. I checked our first round tee time on the Symetra website Thursday and noticed we were in the morning which was unusual. If you’re in a late pro-am, a late first round is almost guaranteed. Turned out they posted the second round instead of the first. Well done. After the Fuccillo Kia Classic we have a week off. Wonder were the wind will take me? This entry was posted on Saturday, July 28th, 2018 at 4:51 am and is filed under Uncategorized. You can follow any responses to this entry through the RSS 2.0 feed. You can leave a response, or trackback from your own site.